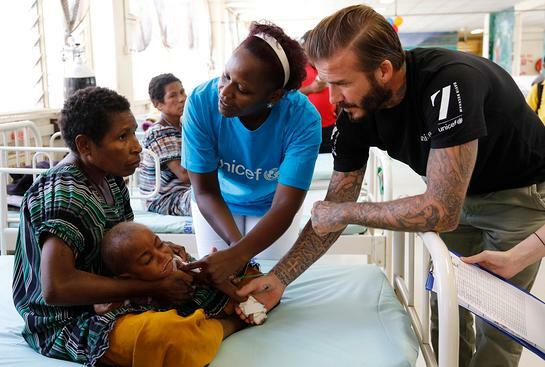 UNICEF Goodwill Ambassador David Beckham today met children receiving treatment for malnutrition at a UNICEF-supported hospital in Papua New Guinea. One child in 13 in Papua New Guinea dies before they reach their fifth birthday, with malnutrition the underlying cause for the majority of under-five deaths in the country. National statistics show that close to half of children in Papua New Guinea suffer from stunting. Earlier this year Beckham launched 7: The David Beckham UNICEF Fund, making a personal commitment to use his voice, influence and connections to raise vital funds and rally for lasting change for children. The Fund is helping UNICEF to deliver life-changing programmes for children across every region of the world, including those affected by malnutrition in Papua New Guinea. David’s commitment to UNICEF will continue with an emotional return to Old Trafford on Saturday 14th November, where he will captain a Great Britain and Ireland star line-up against a Rest of the World team led by Zinedine Zidane. The Match for Children will raise awareness and vital funds for his UNICEF Fund. To find out more about 7: The David Beckham UNICEF Fund visit www.7.org and to support its work visit support.unicef.org/7.